Andrea A. Nguyen is a member of the firm’s transactional team. Her developing practice includes estate planning, probate, and trust administration, with experience in trust and estate litigation and conservatorship matters. Ms. Nguyen’s practice also extends to business entities and real estate law and includes corporation, limited liability company, and partnership formation as well as real estate transactions and title transfers. Ms. Nguyen earned her B.A. in Political Economy at the University of California, Berkeley. She graduated from Santa Clara University School of Law where she received the Emery Law Scholarship for academic achievement and professional promise, and was a member of the Vietnamese American Law Students Association and the Women and Law Association. During law school, Ms. Nguyen worked in the family law unit at Bay Area Legal Aid, the largest and only poverty law firm serving seven Bay Area Counties, where she focused on child dissolution, child custody, and domestic violence issues. Ms. Nguyen also worked at the Santa Clara County Superior Court Family Law Facilitator’s Office as a Judicial and Clinical Intern researching and writing legal opinions as well as reconciling California Local Family Rules of Court with new legislation. 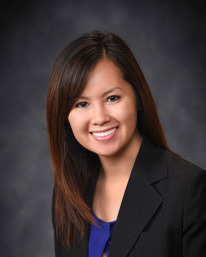 Prior to joining the firm, Ms. Nguyen worked as an associate attorney at the Law Offices of Cheri E. Michaelis where she focused on various aspects of estate planning, probate, trust administration, and business entity formations.